Do you get confused about which of two possible spellings to use? Are you unsure whether it’s disc or disk, sympathise or sympathize, learnt or learned? Then join Finn and Catherine in 6 Minute Vocabulary for some useful tips! Hello! Welcome to 6 Minute Vocabulary with me, Catherine. And me, Finn. And today we’re talking about words that have more than one spelling. Let's start by listening to Jack. He’s a professor of linguistics and he’s talking about changes in the English language. While you listen, think about this question: How do you think the word disc is usually spelt in British English? Today most of the influence on English spelling comes from North America. For example the words analogue, disc, enquire are spelt differently in American English. And these spellings are often used in British English too. And that’s generally all right by us. However, there are other spelling differences that we don’t think are correct in British English. For we Brits, it’s definitely wrong to spell colour or neighbour without the u. It’s also wrong to spell theatre in the American way. So we asked you: how is disc usually spelt in British English? And the answer is that it’s usually spelt with a c, so d-i-s-c. But in American English, it’s spelt d-i-s-k. So two different spellings there, but it's ok to spell disk with a k in British English when we're talking about computers and computing. What other words were mentioned? Let’s have our first clip. For example the words analogue, disc, enquire are spelt differently in American English. So another computing term there: the word analogue, as in analogue clock, is spelt a-n-a-l-o-g-u-e in British English. But it’s spelt without the u-e in American English: so a-n-a-l-o-g.
… but it's good to be aware of the differences. Now, the word enquire, meaning to ask about something, usually begins with the letter e in British English: e-n-q-u-i-r-e, whereas in American English it's spelt with an i at the beginning, not an e. Did you notice the word spelt? That’s the past participle of the verb spell. Yes, that’s s-p-e-l-t in British English. But in North America, they prefer spelled, s-p-e-l-l-e-d.
We’re happy with both nowadays. You can choose which to use. It’s the same for other verbs like learn, dream and burn. You can say learnt, burnt and dreamt with a t at the end or learned, burned and dreamed with e-d.
And there's a slight difference in pronunciation there too, isn't there? Yes, even in my best British accent you can hear the d and the t sounds at the end: burned, burnt. Learned, learnt. Now some words have two spellings - but it’s nothing to do with American influence. Listen to this clip. And that’s generally all right by us. And there we heard all right. You can spell that as two words, all and right. Or you can spell it as one word: a-l-r-i-g-h-t. It's becoming quite common to see all right as two words, although some people still think that alright as one word is incorrect when writing. Other words with two spellings are barbecue, meaning cooking food outdoors, spelt b-a-r-b-e-C-u-e or b-a-r-b-e-Q-u-e.
And there’s also racket as in tennis racket. It’s almost always spelt r-a-c-k-e-t, but it can be spelt r-a-c-q-u-e-t as well. One more clip please. It’s definitely wrong to spell colour or neighbour without the u. So colour, spelt c-o-l-o-u-r is c-o-l-o-r in American English. American spelling drops the u in words with o-u in them. And there are a lot of words that end in r-e in British English but e-r in American English, like theatre, centre and kilometre. And right now it’s quiz time! Number one: Everybody knows that if you play with fire, you might get burnt. But what are the two possible ways to spell the past participle of the verb burn? Number two. How do we spell all right when it’s one word? Number three: What’s the American English spelling of the word flavour? It's f-l-a-v-o-r without the u. Well done if you got those all right. And before we go, here’s a vocabulary tip. If you use a computer to write in English, use a spellchecker, and make sure you set it to your preferred variety of English. There’s more about this at bbclearningenglish.com. You can download 6 Minute Vocabulary from our Intermediate Unit 19 Downloads page. Remember to subscribe to the podcast version! Some words have two possible spellings in British English, for example: analogue, disc, enquire. Sometimes the second spelling comes from American English. Disc can be spelt d-i-s-c or d-i-s-k for computing terms. Some words ending in -ise or -yse are spelt -ize and -yze in American English. That spelling is generally accepted in British English too. The past form of some verbs can be spelt in two ways in British English. But the -ed ending is preferred in American English. Other words have two spellings, not from any American influence. Some American English spellings are not accepted as correct in British English. Two common examples are words with ou in them and words ending in -re. So, how well do you know these differences? 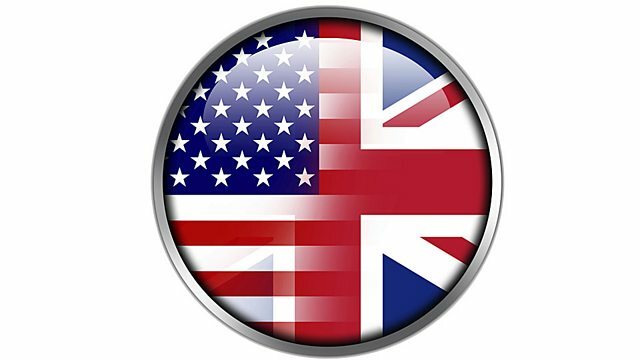 On the next page, we'll do a quiz about British and American English. See you there! Some words have two possible spellings in British English, for example analogue, disc, enquire. Sometimes the second spelling comes from American English.